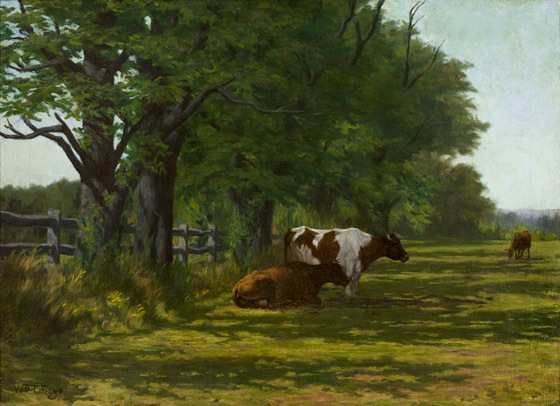 Two cows rest in the shade of trees growing along a country fence on the left while a third cow grazes in the right-hand background. The animals are identical to a group of cows in another painting, Evening, Into the Barn, and must have been pastured on one of the farms close to Trego's North Wales home. The study of sunlight falling on the lavender gray fence, through the trees, and onto the meadow and the cows is soft and romantic and borders on the impressionistic. The painting is owned by a descendant of Watson Trego, uncle of the artist. It was obtained from the artist and has been passed down in the extended family ever since. The painting is in excellent condition, having been restored by Joseph Amarotico of the Pennsylvania Academy of Fine Arts some years ago.